Filing divorce papers is the first step in the divorce process. States require that you or your spouse meet the residency requirement of that state in order to have jurisdiction over your divorce. The amount of time needed to qualify as a resident varies from state to state, so you will need to check your individual state laws to verify that you meet the requirements. If you and your spouse live in different states, it is possible to file in either state if you both meet the residency requirements of that state. Once residency requirements are met and jurisdiction is decided, the divorce petition needs to be completed. 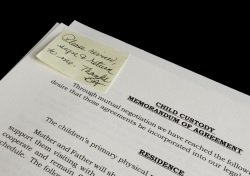 This document states the names of the parties involved in the divorce (including children), the proposed property division, child custody and support, and any other information relevant to the divorce. From there, the divorce papers are filed in the courthouse of the county that will have jurisdiction over the case, and a copy of the petition is served on your spouse. How do I file for a fast divorce? Does the petition for dissolution of marriage need to be filed first? How long do you have to be married to get a divorce? Can you get a divorce without notifying the other person? Do I need child support orders in place before I file for divorce? Do I need my spouse's consent to file for divorce? Do I need my marriage license to file for a divorce? Can I still file for divorce if he destroyed the marriage license? Which date do we use for filing if we had two wedding ceremonies? Can a guardian file for divorce on behalf of a disabled person? Who pays the fees for a divorce? Do I need to do anything else before filing the divorce agreement? Can I still file for divorce if the paperwork is 2 years old? Can someone else file the divorce papers at the courthouse for me? Are there any other steps after you file for a divorce? Can I file an uncontested divorce if there is nothing to divide? How do I change from a contested to an uncontested divorce? Does the property have to be sold if we file "Dissolution of Marriage - With Property"? Can I file for a Summary Dissolution due to our long separation? What type of divorce should I file if my son died? Do I list my son on the divorce papers if his dad has no legal claim? Does it matter if he files in a different county than I live? What if we moved to another county after filing for divorce? Do you have to file for divorce in the same state you were married in? Where do I file for divorce if my husband lives in another state? Are there obstacles if divorcing spouses live in different states? Does he have to travel to the state where the divorce is filed? Where do I file if my children were born in different states? Do I need to file for divorce in the US if I divorced in another country? Can I file for a US divorce even if we married in another country? Can I file for a divorce in the US (where he lives) if I live overseas? Can I divorce if our foreign marriage license was destroyed? How do I get a divorce he lives in the US and I live in Australia? Where do I file for divorce if I have dual citizenship? How can I find out if my husband has filed for divorce? How can I find out if my lawyer filed the divorce papers? Help. I filed for divorce but he wasn't served in the time limit. Why would someone file for divorce, but not serve the petition? How can I make him file the completed divorce papers? He said he filed the divorce papers but there is no case pending. Can he file for divorce if I've already filed? Will my case have to be dismissed if he filed first? Can he re-file as the plaintiff if I already filed and we're negotiating? If our divorce is stalled another state, can I file in my home state? What happens if I file for a divorce, but he won't sign? What can I do if I filed for divorce, but now want to stop it? Can I get my filing fee back if I change my mind about divorce? Do I need to re-file or can we just sign the divorce papers filed 3 years ago? What if I noticed some errors after I filed for divorce? Can the petitioner change the separation date after filing? What does the "filing date" refer to in the divorce records? Shell's Question: How do I file for a fast divorce? I am getting married in two months and need to get this taken care of. Brette's Answer: Two months may be unrealistic depending on how quickly things move in your courts and how easily you can reach your ex. The fastest thing to do is to file for an uncontested divorce, where he completely agrees and signs off on it. You need to determine if there are waiting periods in your state and what the process entails. Visit the website for your state court system or call the court clerk's office. Good luck. Sheena's Question: I filed all my paperwork and went to the court house to see the judge. When I got to the judge I was somehow missing the "petition for dissolution of marriage". And was informed I had to start the paperwork all over. Why? Brette's Answer: This form is what opens the case and it has to served on your spouse for the case to move forward. Question: I have only been married for 2 months, but want to file for a divorce. Will I encounter any problems in doing so? Brette's Answer: No, it doesn't matter how long you've been married. You can seek a divorce at any point. Can I get a divorce without notifying my spouse? Mona's Question: I would like to know how a Divorce is obtained when the other party is not notified. Brette's Answer: You must always notify the other party. He must be served with papers notifying him of the divorce and giving him an opportunity to respond. However, the court will permit notification by publication if you are unable to locate him after a reasonable effort. You can do this by publishing a notice in a newspaper or publication chosen by the court and then wait to see if the other party responds. If he doesn't respond, the case will proceed without him. Click on the following link to read more about how to notify your spouse that a divorce has been started. Raquel's Question: I left my husband and have no idea where he is or how to get a hold of him. It's been over two years. What do I do to get the divorce process started? Brette's Answer: Check your state court website or visit the court clerk's office. You'll need to determine what the process is for your state, but generally you would file then get permission from the court to serve him via publication if you cannot locate him. I suggest getting an attorney to handle this for you. Connie's Question: Do you have to have a child support order in place to file for a divorce? I am filing divorce myself. Brette's Answer: No. Child support can be ordered as part of the divorce. Can I file for divorce even if my spouse doesn't consent? Cary's Question: Although we both decided on divorce and preferably mediation 5 weeks ago, my husband now says he is not ready and has stopped communicating with me. Can I just file with the court even if he doesn't respond? Brette's Answer: Yes, one person can file but the other must be served. You need to talk to an attorney in your state about your state's laws and procedures. You don't need your spouse's consent to get a divorce though - if you want one, you can go file now. He can certainly drag things out a bit if he isn't ready to move forward. Mediation is an excellent idea if you can get him to go. Roseann's Question: Do I need to show my marriage certificate in order to get a divorce? Brette: In most places you do not, however you do need to be able to list the date and place of the marriage. Can I still file for divorce if he destroyed our marriage license? Donna's Question: What are my rights if my husband intentionally destroys the marriage license, so my marriage is not recorded? Brette's Answer: If he destroyed your copy, you can just get another copy from the town or city where it was recorded. If he destroyed the original marriage license before it could be filed, you are still legally married and you have witnesses to that fact. You can file for divorce. Tracy's Question: My marriage license from Cyprus has been destroyed and my husband has abandoned me for over 5 years. I now live in America. Am I still legally married here with no papers on record? What happens if I want to get married here in America? Brette's Answer: Yes, legally you are still married until you get divorced. You generally do not need to provide the certificate of marriage to obtain a divorce. You just need to know the date and place of the marriage. If you are unable to locate him, you can probably obtain a divorce with authorization from the court to publish the notice of service. Which date do we use if we had two wedding ceremonies? Dianna's Question: I was married in Reno in January without anybody knowing it, and then we got married in California where we had the "planned" married in April of the same year. Which date do we use for filing a divorce or does it really matter? Brette's Answer: The second wedding was a renewal of vows. As long as your marriage certificate has the first date, that counts as your legal date of marriage. Brenda's Question: I have a disabled daughter who I have guardianship of. Her husband shot her and she is unable to make any decisions for herself. I do not want anything happen to her and have him obtain any of her social security in the future. How do I as guardian get her divorced? Brette: You should be able to file for divorce and sign the papers, listing yourself as legal guardian. I would recommend you consult with an attorney in your state to discuss this. April's Question: I don't want a divorce, but my husband says he is going to file the papers. I'm not sure what kinds of fees there are, but I don't think I should have to pay any type of fees if I don't want a divorce. Brette's Answer: If he files the he pays court fees. You will want to at least consult with an attorney though. Do I need to do anything before filing the divorce agreement? Kelly Asks: We've been separated for 2 years and have a custody agreement already in place. I used an internet site to fill out a divorce agreement, which I'm sure he'll sign. Is there anything else I need to do before filing this? Is there a complaint that I have to file first? Brette's Answer: Yes, each state has its own requirements, and the agreement you found online might not be acceptable in your state. You should check with a lawyer or go to your state court site and look for a do-it-yourself (sometimes called pro se) packet. Laura's Question: I had legal zoom draw up papers for an uncontested divorce, but never filed. The paperwork is 2 years old and the dividing up stuff has changed. Can I still file? Brette's Answer: The laws and forms in your state may have changed in that time frame, so you would need to check that. If what you are asking for has changed, then the documents will not be accurate and should not be used without updating them. Bianca's Question: If I already have the papers, & they are filled out by both parties, could my mother or father file my divorce papers for me? Brette's Answer: If you mean can they drop them off at the courthouse, yes, anyone can drop paperwork off. Diane's Question: After you file for a divorce is there a next step? Can I file an uncontested divorce is there's nothing to divide? Liz's Question: My husband and I have lived apart for nearly two years. We have not been intimate for a year now, live in different places, and have our own lives. Someone said that I can just file uncontested papers at the courthouse? Is that possible? I don't want anything from him. Brette's Answer: Yes, an uncontested divorce is always an option. You need to contact the clerk's office in the county you live in and obtain a divorce packet there. You file in the county of your residence. 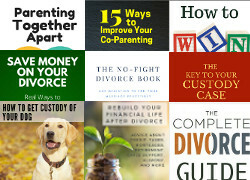 Your state may also have an online divorce help site you can read, on your state court web site. Follow the instructions for filing. Your spouse must always receive notice of the divorce. If he chooses not to respond or appear, the case continues without him. Jessica Asks: I filed for a contested divorce but we have now reached an agreement. Can I change to uncontested, or do I have to dismiss and refile? Brette's Answer: No you can just file the stipulation created by your attorneys or mediator. If you don't have an attorney or mediator, you can go to court and read your agreement into the record. Your stipulation/agreement becomes the terms of the judgment, assuming it is approved by the judge. Congratulations on coming to a settlement! My husband wants to file "No Property" because he says that the other filing will cause the court to force sale of the property NOW or it will go to auction. Is this true? I don't want to get screwed out of my 1/2 of the profits of the property. Brette's Answer: The court will not force you to sell property, particularly if you have a plan for how to divide it. You would be committing perjury to tell the court you have no property. You definitely want your property division included in your decree so that it is enforceable. Margarita's Question: I have been legally married for 20 years, however we were separated a month after we were married. He was in the military at the time and we never lived together. Can I file Summary Dissolution given that we separated shortly after the marriage or do I still have to file a regular divorce? Brette's Answer: You need to read the rules set out by your state for the type of divorce you qualify for. If you file the wrong papers, the court will reject them and you can re-file the correct ones, however you'll have paid fees for both sets of papers, so it's best to try to get it right. Melinda's Question: I live in Nebraska and my only son was 18 years old and died. I've been separated for 15 years. How do I file for a divorce; with or without children? Brette's Answer: I'm sorry about your son. You would file without since custody does not need to be determined. Good luck. Do I list my son on the divorce if his dad has no legal claim? Mary's Question: My son's father is not on his birth certificate. He was out of the country, but he did have video chats weekly. He came in the country and we got married when my son was 17 months. We separated 5 months later and I am filing for divorce due to abuse. Do I have to list my son in the divorce papers at all, given his father does not have legal rights? Brette's Answer: You don’t have to since he is not legally the father. However, I assume your husband will want contact with your child and you will go to the time and expense of paternity testing and proceedings when you know the outcome. You should discuss your options with your attorney. Mary Ellen's Question: If I got married in one state but now we live in another state, where do I file for a divorce? Brette Answers: You file in the state you currently reside in. Be aware though that most states have a residency requirement that requires either that you live there for several months, or that the reason for the divorce arose in the state. Crystal's Question: My husband moved me and the kids into an apartment 200 miles away and told us he was being transferred soon. Now he has just told me he is going to file for divorce. Does it matter if he files in a different county than I live? I am looking into lawyers here where I live, but if he files where he lives will I have to travel for this and get a different lawyer? Brette's Answer: I'm sorry to hear about your predicament. One thing you can do is file in family court where you are now for custody, child support and spousal support. This will help you get on your feet financially. Where the divorce should be heard is a jurisdiction or venue question. If you're in the same state, then it can likely be heard in either county. Since it would be a hardship for you to travel to his locale, you have a good argument for a transfer to where you are, as long as you meet the residency requirements. Your other option is file yourself for divorce. A lawyer can help you through these decisions. Call the bar association in your area and ask for a referral. Good luck. Summer's Question: The Divorce was filed and we were in the process of sorting the issues out in court, but reconciled after 3 months. We moved to a new county and after 10 months we can't make it work. What happens when a divorce is just halted in the middle (we didn't file a postponement)? Can I re-file the divorce in the new county? Brette's Answer: You may need to withdraw from the other county (if it was not dismissed) and file in the new county. You might be able to ask for a transfer of the case, so check with an attorney. Sandra's Question: If you live in a different state than your spouse, can you divorce in the state you live or do you have to be in the same state as your spouse? Also, if he files in New York and I would like to use an attorney from Georgia is this okay? Brette's Answer: You can divorce in the state you live in, if you meet the divorce residency requirements. If he files in one state, you will need an attorney in that state, unless the attorney you hire in GA is licensed to practice in NY and you're willing to pay for the travel. Good luck. Laurel's Question: What kind of complications will arise if the party filing for divorce is in one state and the soon-to-be ex lives in a different state? They have a 9 year old, he owes child support, and he is currently living with someone else, who also has a child. Brette's Answer: The issue will be where jurisdiction is. The other things are not really problems, just factors that will affect how child support is calculated. Lisa's Question: How do I get divorced when my husband and I live in two different states? We've only been married for a year, and I don't want anything of his and I'm sure he doesn't want anything of mine. I just want a divorce. Can we get a divorce without one of us having to fly to another state? Brette's Answer: If you meet the residency requirements of your current state, you can file there. He can file affidavits to indicate his consent. Khouri's Question: I have lived in my state for about 7 months, and gave birth to our third child while here. My husband still resides in a different state. Does giving birth to a child in another state cause an issue about where I should file? Brette's Answer: It doesn't matter where your children were born. Residency requirements will govern where you file for divorce. Lior's Question: I was married in California in 27 years ago with the marriage license filed in Oakland. I’ve been living in Israel for the last 9 years and am currently divorcing there. I plan on coming back to the Bay Area. Do I need to file for divorce here or does my divorce in Israel apply here? Brette's Answer: No. Divorce is recognized from another country. Can I file for divorce in the US if I married in another country? SJC's Question: I was married in the Virgin Islands and live in United States now. We do not have a record of our getting married here in the courts. Is it possible to file for an uncontested divorce in the United States? Brette's Answer: Your marriage is recognized in the U.S. and if you meet the residency requirements of the state you live in, you can divorce here. Can I file for divorce in the US (where he lives) if I live overseas? Jenny's Question: We were married 8 years ago in China and move to Texas soon afterwards. I went back to China earlier this year for a temporary job and my husband is having an affair. My husband meets Texas residency requirement and I do not. Can I file for divorce in Texas without meeting residency requirement? I appreciate your answer. Brette's Answer: Generally only one of the spouses has to meet the residency requirements to be able to file for divorce, so if your spouse is a resident then the divorce can be heard. How do I get divorced he lives in the US and I live in Australia? Helen's Question: I am an Australian citizen who is an exchange student and my husband is an Ohio native. I am now in Australia, married to a US citizen and have no idea what I can do to dissolve my marriage from here. How do I proceed? Brette's Answer: Since you are a citizen of Australia, you should be able to file there, however you'll have to check to see if you meet requirements, such as having been there long enough and so on. Andrea's Question: I have residency in both the United States and Ontario, Canada. Is there one location that is typically better for me to get divorced in? How can I find out if my husband has filed for a divorce? Maureen's Question: How can I find out if my husband filed for divorce? Brette's Answer: You would need to be served with papers for the divorce to be legal. If you're worried perhaps that you should have been served and wasn't, go to the court clerk's office in the county he lives in and ask for a search using your name. You should also check in your county if you live in two different places. Sherry's Question: How can I find out if my attorney really filed divorce papers without running back and forth to court? Brette's Answer: Call your attorney and ask for a copy of the receipt. Help. I filed for divorce but he wasn't served in the time limit? Dina's Question: My divorce was defective since the affidavit of service indicates service was made 420 days after filing the summons with notice. What can I do now? Brette's Answer: You probably have to start all over and re-file from the beginning. A quick phone consult with an attorney in your area should provide detailed answers. Good luck. Andrea's Question: Why would someone file the petition for divorce, but never have the other spouse served? Does the paperwork need to be served to the spouse and recorded in the court for a divorce to proceed? Brette's Answer: Papers do have to be served for a case to continue. There are many reasons a person might file and then not follow through - running out of money, changing their mind, being unsure how to handle service and so on. Can I make him file the completed divorce papers? Jenn's Question: My husband downloaded the divorce papers off of the internet, and gave them to me to sign. I took the papers in and had them notarized, and gave them back, 7 months ago. 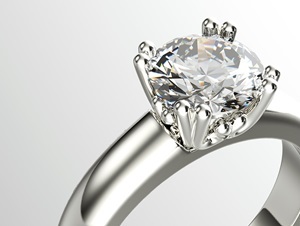 He has yet to file them, and I am getting married soon, and need this done. Can I make him file the papers, or should I retain an attorney and do it myself? Brette's Answer: You can't make him file them. If he does not pursue the case, it can technically be dismissed, but you can counter sue for divorce to keep it going. You should talk to your attorney to determine if it makes sense in your state to have the first case dismissed and file a new one in which he will default or convert the current case. I wouldn't plan a wedding yet - a divorce can take a long time if he contests it. Good luck. Cynthia's Question: I was served divorce papers and I sent the motorized papers by fax to his certified divorce and family mediators, but they never kept me posted on the progress. I searched if there's a case open and no results. I just want this divorce done. Can he file for divorce if I've already filed and served him papers? Mele's Question: Can my husband file for divorce after he's already been served with the divorce papers I filed? Brette's Answer: If you have already opened a case, in most states he can file another one, but you can ask to have the case dismissed. Susan's Question: My husband filed first then I did. He was served first and then I was. Now his attorney is asking my attorney to dismiss my case and move it to the county where my husband's attorney filed. Can they do that? Brette's Answer: One of the cases is going to have to be withdrawn and it's a matter of negotiating which. Since they filed first that seems to be an obvious solution, but you should talk to your attorney about the options. Linda's Question: I filed for divorce citing irreconcilable differences. 8 months into negotiating the agreement, my husband wants to re-file as the plaintiff and cite adultery. Is this possible? Brette: He can file a cross-petition but he can't make you withdraw yours. Maggie's Question: My soon-to-be ex has filed for a divorce in the state that he is currently living in, but the courts have kicked back our uncontested cased for over a year. I have signed the papers and I want to have this finalized. Can I go ahead and file for divorce in my home state, even though the original divorce is being processed in another state? Brette's Answer: Probably not. If there is a case already in progress in another state where there is jurisdiction it is unlikely your state would let you move forward. You can focus on getting the divorce finalized where it is already in progress. It sounds like you have much of the work done already. If you're frustrated with the process you could always file a counter-petition in the same case to try to get things to move forward. Find out what the problem is with the current paperwork and work to get it resolved. It might be worth a few hundred dollars to consult with an attorney who could take a look at it and tell you what's wrong. What if one spouse refuses to sign after divorce papers are filed? Jade's Question: What happens when one spouse files for divorce and the other spouse refuses to sign or accept the divorce? Brette's Answer: The case moves forward. The judge decides if there will be a divorce or not. What can I do if filed for a divorce, but now want to stop it? June's Question: I filed for a divorce and my husband received the service, but completed it incorrectly, so the court sent it back to him. I now want to stop the divorce. How do I do this, as I don't have any legal representation? Brette's Answer: Call the court clerk where the divorce petition was filed and ask what procedure to follow to withdraw the case. Ester's Question: Is it possible to get my filing fee back if I changed my mind about getting a divorce? I've already filed and paid the $408 CASH. Brette's Answer: Check with the court clerk, but in general, no. The fee is for the processing and if you change your mind you can't get it back. Nicole's Question: I filed for a divorce 3 years ago and served my husband with papers. He did nothing after that and we tried to work it out, but never notified the courts of this. I have received nothing from the courts and we are now separated and want a divorce. He says the divorce is not valid anymore. We have a case number. Do I need to file another divorce or can he just go to the court house and sign the papers filed three years ago? Brette's Answer: A case will usually be dismissed after a certain period of time if it isn't moving forward. Call the court clerk's office and ask. What can I do if I found mistakes after I filed for a divorce? Brenda's Question: I just notice I put some inaccurate information in my divorce papers. My husband has been already served. How can I correct it? Brette: You can simply amend the papers you filed with the correct information by submitting a new version. Call the court clerk and ask how to revise or amend papers. Dawn's Question: If the petitioner filed original papers with the court with date of separation, how is it possible that the petitioner can change their mind and claim a new date of separation? Danelle's Question: In the state of CA, what does the "filing date" refer to in the divorce records? Is it the date the divorce was FINALIZED, or the date the process began (papers served to respondent)? Brette's Answer: I'm unable to answer state specific questions so you need to check state laws to be sure, but in general filing date usually refers to the date the divorce is commenced.